Early smartwatches were often bulky, boxy things that were designed for cutting-edge tech enthusiasts, but absolutely failed on fashion. But smartwatches have come a long way in the past few years. Anyone who wants to have all (or at least most) of the benefits of their smartphone right on their wrist can have it without making a fashion faux pas. Not only have big technology companies like Apple and LG created watches that are stylish as well as functional — even fashion brands like Armani and Kate Spade are getting in on the smartwatch game. When you're shopping for smartwatches, there are a few things you need to consider. Firstly, you should decide whether you want a hybrid smartwatch or full-fledged smartwatch. 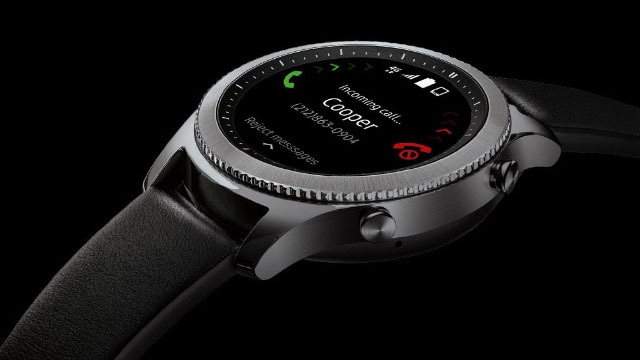 A hybrid smartwatch has the appearance of a traditional watch with a few connected features, fitness tracking and vibrating when you get a phone call. Fewer smart features lets watchmakers focus on style, giving you a wide range of fashionable options — and the lack of those features also gives them great battery life. A non-hybrid smartwatch swaps the traditional watch face for an LED display, which can mimic the look of a traditional watch but also act as a display for just about anything. They're practically a miniature version of your smartphone attached to your wrist: you can view notifications and emails, control the music you're playing, and often use your voice assistant and even make calls. While some of these simply work via a Bluetooth connection to your phone, others have their own cellular connection, letting you essentially carry a smartphone without having to carry your smartphone. However, all of this technology comes at the cost of battery life: you can't expect any of them to last longer than a day. You also have to consider what kind of phone you'll use the watch with. 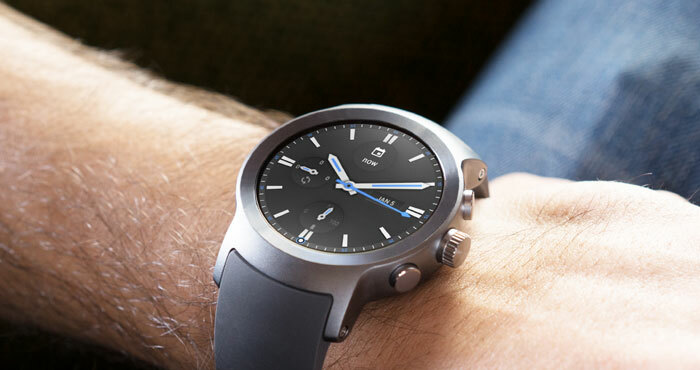 While simple hybrid smartwatches typically work fine with any type of phone, full-fledged smartwatches usually work better with specific types of phones. If you have an iPhone, you can use an Android Wear device, but you won't get all of the features you would get if you had an Android phone. And Apple Watch doesn't support Android at all. You'll have to bear that in mind when smartwatch shopping. Beyond that, you're considering looks and features. Not all of us want the same things out of a smartwatch, so this is all about prioritizing what's important to you. While some features are standard — like notifications and at least some fitness tracking — the exact features each smartwatch has will vary. Do you want to be able to listen to music during your morning jog without carrying your smartphone? Do you want to be able to make calls and use your voice assistant from your wrist? When you know what you want a smartwatch for, it should be simple to decide on what your smartwatch needs to be able to do. Now let's take a look at your options in high-style smartwatches. 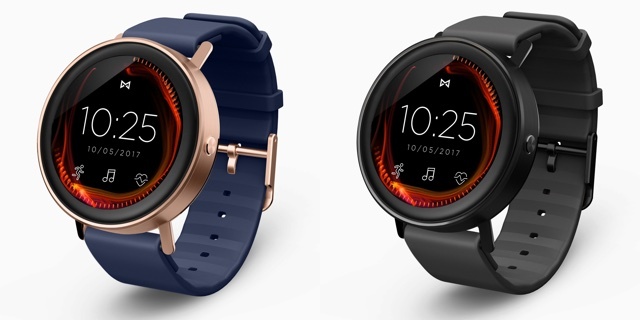 The Misfit brand is best known for its fitness trackers, and its Vapor smartwatch does have a somewhat sporty look, as it comes packaged with a silicone sports band. Still, the clean lines of this watch are quite elegant, and it can be dressed up with bands that come in a variety of colors and materials. Still, the dressiest band option is simple leather, and we wish there were something that gave this more of a high-end look, like Apple Watch's stainless steel Milanese loop. The watch runs Android Wear 2.0, which will integrate neatly with notifications from your Android smartphone and works with tons of Android apps. The round watch face is a touchscreen which can be customized with a more traditional or more modern watch face. As you might expect from Misfit, the watch is a very solid fitness tracker, including a heart-rate sensor, water resistance for swimmers, built-in GPS to track runs, and a standalone music player so you can listen while working out even if you don't have your smartphone. Want something simpler? 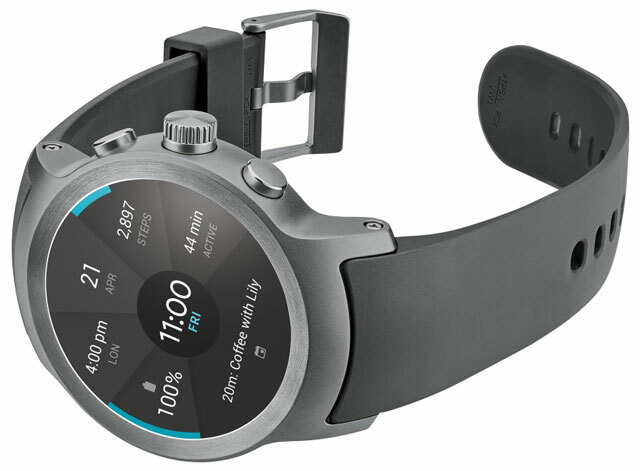 The Misfit Phase hybrid smartwatch has basic connected features and an ordinary watch face, though for $149.99 it doesn't cost much less than the Vapor. There's no getting around it: the Apple Watch is simply the best smartwatch for iPhone users. iOS and watchOS work together seamlessly to provide easy access to your apps and notifications straight from your wrist, and Apple Pay lets you pay for goods with a tap of your wrist, too. The Apple Watch 3 has built-in cellular service, letting you make calls, send texts, and even get alerts from the watch without having your phone. It's essentially a tiny smartphone attached to your wrist. It's also a full-fledged fitness tracker that matches Misfit's Vapor feature for feature: it has a heartrate monitor, built-in GPS, water resistance, and a standalone music player as well as the ability to stream from Apple Music. The Apple Watch's appearance won't please anyone who wants a traditional look, however. Its squared-off shape matches the modern aesthetic of the iPhone, and though you can customize it with a variety of bands, you can't escape the high-tech look of the watch itself. But leather bands — and matching watch faces — from Hermes can give the watch a very style with signature Hermes looks. 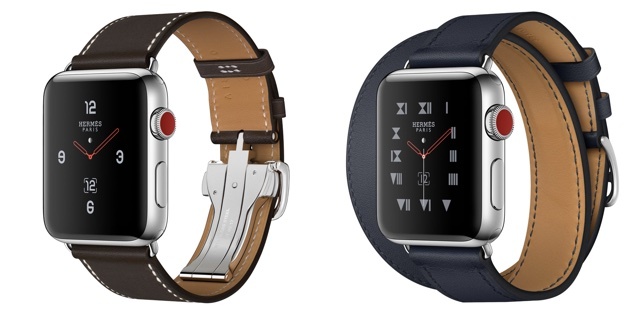 However, you'll pay for them, with an Apple Watch 3 with a Hermes band starts at $1,199 and goes up from there. But if you love the look, you can always pick up the Apple Watch 3 ($329) with a standard band and look for bands from independent leatherworkers. For the savings, you may not mind going with a plainer look. Taking a page out of Apple's playbook, Samsung's Gear S3 is heavily integrated with its own smartphones — so while you can use it with iPhone or other Android devices, it has the most features when used with Samsung's own smartphones. That's because it runs its own OS, Tizen, which has allowed Samsung to really customize its smartwatch experience. Unfortunately, by using a unique OS, the Gear S3 has a limited number of apps — it covers the basics and recently added Spotify, but you won't find as robust a selection as you will on Android Wear or watchOS. The watch can also perform mobile payments, but only using Samsung Pay rather than Apple or Android's payment systems. The Gear S3 has a large round face with an always-on AMOLED display that does a good job of mimicking a traditional watch. The bezel around the outer edge rotates to interface with apps, which is a novel — and surprisingly intuitive — alternative to buttons and touchscreens that are more common on other smartwatches. Feature-wise, it's everything you would expect from a good smartwatch: it matches the Misfit Vapor and Apple Watch 3 for fitness features, and syncs with your smartphone for notifications and more. If you dislike the clean lines of the Gear S3 Classic, the Frontier model has the exact same features with a more ruggedized look (and a slightly higher price tag). The LG Watch has a minimalistic design that reminds us a bit of the Misfit Vapor — but where the Vapor has a modern, high-tech look, the LG Watch looks like a classic timepiece. It has a large, round P-OLED face which, like the Samsung Gear S3, can do an excellent job of mimicking a traditional watch face. It runs Android Wear, so you can expect excellent integration with Android smartphones, Android Pay integration, and a wide range of apps to chose from. It also includes some nice high-end features, despite its reasonable $250 price. The LG Watch Sport has built-in cellular service, which lets you use it without your smartphone (so long as you're willing to pay for the privilege), plus Google Assistant for fully hands-free control. That's a combination of features you'll only find in the Apple Watch, which makes this LG model a strong option for Android users who want to have it all. But what really makes the Watch Sport stand out from other Android Wear devices is its fitness features. It hits everything you want from a fitness tracker, with a heart-rate monitor and GPS tracking (though unlike its compatriots, it isn't suitable for swimming). However, it tracks workouts better than many smartwatches (or even fitness trackers). An assortment of sensors allows the watch to keep tabs on your strength training routine, logging and counting reps on its own. With most trackers focusing on running and other cardiovascular workouts, this is a handy feature for fitness buffs. A lot of smartwatches — even more fashionable options — trend towards modern designs that suit a high tech gadget. 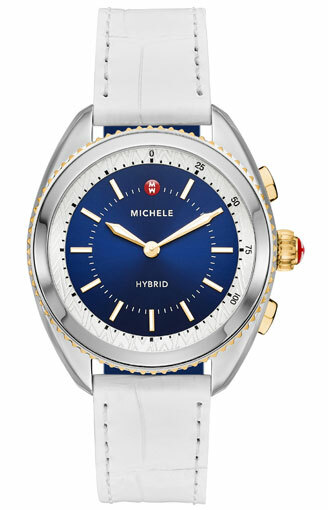 If that's not the look you want, often you need to look to a hybrid smartwatch with fewer features, but not so with the Michael Kors Access Sofie. This is a full-fledged Android Wear smartwatch, with a round touchscreen AMOLED display — and while that may sound high tech, the design is all glamour. 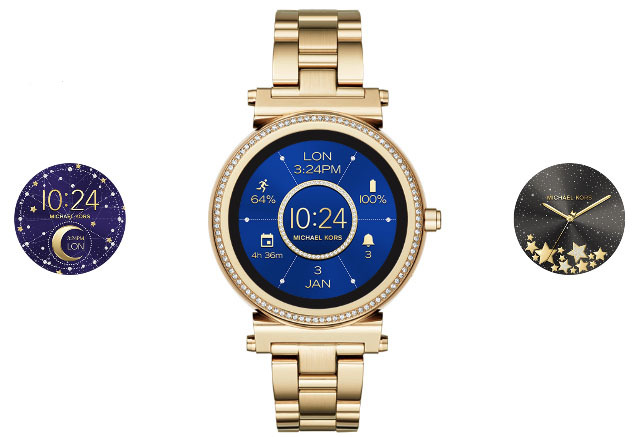 The bezel is embellished with a pavé setting of gemstones — a familiar Michael Kors style, but a lot of glitz for a smartwatch. You can swap watch faces and bands to fit the day's look, but no matter how you customize it, this is a striking smartwatch. The upscale looks make it a perfect companion for a night out, though it's overkill for a trip to the gym (despite having basic fitness tracking features). The Sofie comes in rose gold, gold, silver, and a silver version with a gemstone-studded band for a slightly pricier $495. We're sure plenty more fashion brands will pile on to the smartwatch bandwagon, so if you're interested in fashion-forward technology, keep your eyes open — there's no doubt more to come. These are really awesome watches. Smart watches have arrived. While not a necessity the good ones are a convenience. I have an Apple Watch 2 and an LG Watch Sport. The Apple Watch is a bit more advanced and easier to set up but the LG isn’t too far behind. I really like the Android Wear 2.0. It does everything the Apple Watch does only with Google Assistant which beats Siri.